I may or may not be stealing this story from the Vlogbrothers on youtube. However, I think that Florence Foster Jenkins is a great accompaniment to Jessa’s recent post taking on theory–especially in regards to “extraordinary” women. 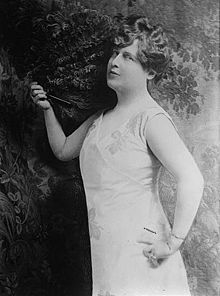 So, for those who don’t know Florence Foster Jenkins is according to wikipedia “an American amateur operatic soprano who was known, and ridiculed, for her lack of rhythm, pitch, tone, aberrant pronunciation of libretti, and overall poor singing ability.” Yeah, so before American Idol’s infamous audition episodes, the world had Ms. Jenkins. Jenkins received music lessons as a child, and expressed a desire to go abroad and study opera, but her father refused to pay so she eloped to Philadelphia with Frank Thornton Jenkins, a physician. The two were married from 1885 to 1902 and her divorce is what spurred her to pursue music again. After the divorce she began to teach and tutor piano. In 1908 she began living with a stage actor, St. Clair Bayfield, who later became her manager. They remained together for the rest of her life. After her father’s death in 1909, Jenkins also inherited a sufficient amount of money to fund her singing career. She began taking lessons again at the age of 41 and got involved with the musical social circles of Philadelphia and New York (where she later founded and funded the Verdi Club). It was at this time that she began giving recitals in 1912. Nonetheless, she still rose in popularity and critics often described her work in a backhanded way that may have piqued public curiosity. Despite her obvious lack of ability, Jenkins was convinced of her greatness and often compared herself favorably to the renowned sopranos of the time. She dismissed any abundant audience laugher during her performances and although aware of her critics, she never let them stand in her way. Jenkins often wore self-desinged, elaborate costumes and even appeared in wings and tinsel. For “Clavelitos,” she threw flowers into the audience from a basket (and on one occasion, she hurled the basket too), while fluttering a fan and sporting more flowers in her hair. After a taxicab crash in 1943 she discovered she could sing “a higher F than ever before,” and sent the cab driver a box of cigars. And audiences loved her. In fact, she was so successful that she restricted her rare performances to only a couple of venues and often handled the distribution of the coveted tickets herself. At the age of 76, she finally yielded to public demand and performed at Carnegie Hall on October 25, 1944 (a month before she died). Tickets sold out weeks in advance. That’s right, this lady who “couldn’t sing” sold out Carnegie Hall weeks before her event. Okay, to be fair, I’m sure there are some of you who are thinking “How is this a great woman of history?” But I have to recognize guts and bravado when I see it and Jenkins had it in spades. Not only did this woman believe she was awesome, but then she proceeded in her own to way to in fact become awesome. I mean, how many of us have performed at sold out shows for years and performed at Carnegie Hall? I also admire her quote because I feel that it is the most important take away from this post. We do what we love because we love to do it. Jenkins may not have done anything that a historian would deem great (and certainly nothing a musician would deem great), but I still think she’s worth admiring because despite everything she still put herself out there for a crowd over and over again until she died…and at least she died with no regrets.